The Group Program Directors role is a demanding and challenging one. There have only been around Twelve people who have held the role of Group Program Director of FM Metro Radio in Australia. It is one one of the most highly specialised and crucial roles in any radio company. It combines programming, strategic and research skills, executive and organisational skills, music knowledge, creativity, people management, talent management as well as drive, determination and leadership. Six of the Elite Twelve are from SCA and Austereo and pre-merger, Hoyts. 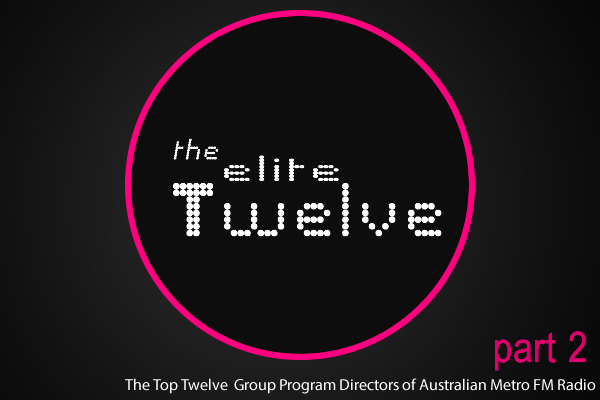 Four of the Elite Twelve are from the Australian Radio Network. And Nova Entertainment (formerly DMG Australia), have only had two GPD’s since it launched 20 years ago. Paul Jackson – 2010 to present 5 years. While the Group PD role has changed over the years, the fundamentals are still the same; its about product, content and ratings. Radio Today asked each of the former and current Group PD’s, the same three questions. We also asked a number of past and present industry experts and peers, for the first word that came to mind to describe each of the Elite Twelve. In Part One we heard from Duncan Campbell, Dean Buchanan, Brad March, Peter Yiamarelos, Guy Dobson and Jeff Allis. Listen very closely before speaking…get all the facts…review in your own mind and always look forward…not back…whenever a station and all the various people involved are sitting around trying to figure out what went wrong…and who to blame…it becomes unproductive…I always try and develop a strategy for the future and let the past be what it is. On one infamous occasion, I did not heed my own comments….did not get all the facts…rushed in…and paid the price…lesson learnt!! What’s the most important factor in programming? Many stations around the world appear unable to grasp the basics…if music takes up 45+ minutes in every hour…get it right…nail the format down properly…and let the presenters provide the real colour…movement…soul…and spirit. I think too many stations have become obsessed with social media etc at the expense of what comes out the speaker…social media is important, however, the window to any radio station…irrespective of the format is the content…on the air. What’s the most important thing for talent to remember? Talk ‘to’ the people….not ‘at’ them…it is amazing how many presenters, again around the world, attempt to take on a persona that is not theirs when they are on the air…yet talking ‘to’ people…rather than ‘at’ them…allows the person to connect with each listener one on one…again, this refers back to basics. Implementation of a great idea is more important than the idea itself. Surf the wave for as long as you can. A truck load of cash will be sent to your bank account every month. Make sure you have a decent chunk of it left when your time in the sun comes to an end. Pick a Content Director who will clear a path for you & keep away interfering upper management & company directors. If you do cross the street make sure the grass is truly greener. What’s the most important lesson learned? Knowledge is no burden to carry – every day there’s always something new to learn whether it’s about the best way to engage listeners via social media, or how to sell a new song coming up on the station. Don’t be afraid to ask questions and seek other input to continue to improve your skills. What’s the most important factor to programming? Live in the listeners world – after all they are the one’s who guide our success when it comes to ratings and revenue. You can play the best songs, in the best rotation, on the best marketed station but if you have no one listening because you’re not part of the listener’s world then it’s all wasted time. What’s the most important thing for great talent? You’re never bigger than the station brand. You can be larger than life yourself, and larger than life on air but the brand is still what is the most enduring part of our success. Patience. When you’re creating something new or making big changes the listeners don’t move as quickly as we’d like to think they do. You have to play the long game and stick to your plan. It can be difficult as there’s often going to be pressure to deliver quick results. Trust your instincts, be consistent and you have a great chance of success. It’s layer after layer of all elements of output and key programming factors working in sync that makes the great stations stand out. However, you must have great people, the most passionate people, the most talented people, the ones who always go the extra mile, whose desire to win is second to none. Off air and on. What’s the most important thing for great talent to remember? The listeners. We tune in to be entertained. To have a laugh, have fun, to hear about things that are interesting to us and that we can relate to. I think Nova’s drive show and all Nova breakfast shows are fine examples of this everyday. A-grade talent make all the difference. You can talk all you like about “your” music versus “theirs”, about marketing, contesting, the importance of digital engagement but none of it matters unless you have the right breakfast show. It really is the difference between winning and losing. In the head of content role it’s about having the courage of your convictions, finding and developing A grade talent, hiring and developing great programmers and communicating effectively both to your teams and to your CEO. The first thing you’re taught in acting school is to “not act”. Nothing is more powerful on radio than someone who is completely authentic. “The audience is always right, even when they’re wrong”. Borrowing a book title there, but what I mean is that the best plans might come adrift from your perspective, but market forces are the true reality. Meeting (and exceeding) audience needs. That means having a good understanding of why people “hire” your radio station, what job is your show required to do when a listener tunes in – they chose you for a purpose, will you meet that need?